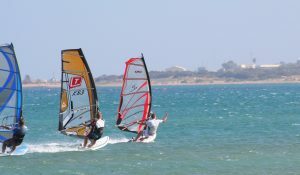 There are lots of Latchi Polis Watersports Cyprus, there are a few companies that offer these services. Latchi Watersports Centre’s main headquarters is based in the heart of Latchi Marina. 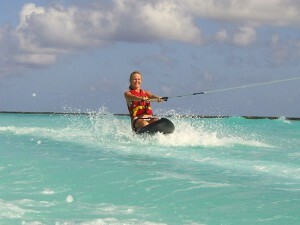 We also have two beach water sports centers and have a wide range of activities to offer you. Experienced and qualified staff lead our diverse program of activities. All of our water sports staff thrive on passing on their skills, techniques, and experience in an environment that is safe and fun. Our instructors have years’ experience. We can offer a wide range of watersports activities including sailing, windsurfing, waterskiing, kayaking, and parasailing. Furthermore, all our equipment is modern and safe. We maintain all of our gear on a regular basis to ensure you have a quality experience. Specialist equipment is provided by us. All you need to bring along is your swimwear and plenty of enthusiasm. Hire a jet ski from Latchi Watersports when you have the need for speed or simply want explore the coastline in a different way. The jetskis are replaced every two years so they are of a very high standard. The design is such that the vessel is very stable and incredibly difficult to capsize. 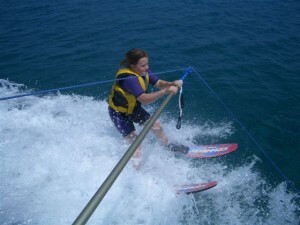 Our renowned ski school has equipment ranging from water skiing, wakeboarding, mono skiing, kneeboarding, and wakeskating. When you wake and see the sea so calm it looks like glass, you’ll also notice. Latchi Watersports’ two ski boats towing customers along the Akamas national park. So join us for thrilling waterski & wake-board days in the Sun! The main attraction is the banana ride. 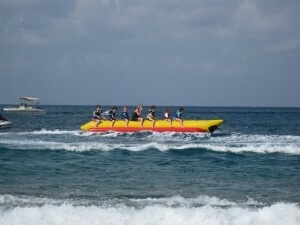 A giant inflatable banana that can seat up to 8 people. Everyone will be giggling at the end of the ride! Rides are open to the smallest of children, with the driver tailoring the speed of the ride accordingly. There is no upper age limit, so it’s fun for the whole family! Latchi Watersports Centre is a RYA Training Centre. RYA Sailing Courses (Dinghy and Multihull), RYA Advanced Sailing Course and Youth Sailing Courses are all available from the Anassa Beach. A huge range of windsurfing equipment is also available. You will be floating over calm waters and beautiful landscapes in complete peace and tranquility. 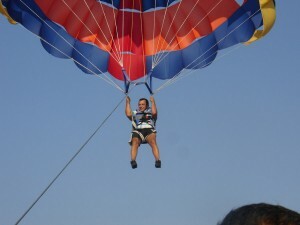 Parasailing offered to everyone, with a double harness also available for two-person rides. Safety is our top priority! 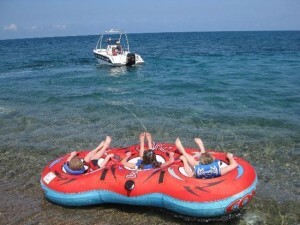 Choose from 4 single and 1 triple sit-on-top canoes as well as single and double kayaks. The safe zone is marked for younger children, but the entire coastline is available for those feeling like a challenge. Handheld radios are available for longer trips.